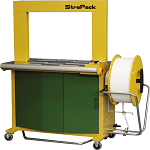 Stainless steel body panels and parts made of stainless steel, aluminum and plastic make the strapack AQ-7M the ideal machine for harsh environments. The bottom of the cabinet is reinforced to provide extra protection where moisture exposure is greatest. The cabinet is fully enclosed in order to protect the components from water and wash-down spray. An internal heat lamp helps evaporate whatever moisture accumulates inside the machine. 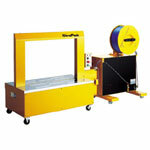 The sealing head is side mounted in order to protect it from moisture and residue. The AQ-7M can strap boxes as small as 3 1/8" high. The roller table height is adjustable and can be removed to fit the AQ-7M into an existing conveyor system. 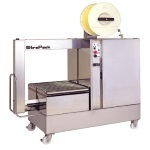 Tension on the AQ-7M is applied with a gripper and tension arm which assures positive and accurate tensioning of damp strapping.In the moisture-laden environments of poultry, meat and seafood processing the AQ-7M is the most durable strapping machine available. The corrosion free, low maintenance delivers results in dependable packaging. 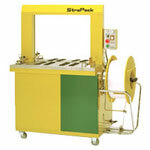 Boatman marking offers a full range of strapack strapping machines and strapping equipment.